Does anybody have any experience with Sea Pens. Do they do well in aquaria?? Are they stirctly filter feeders?? I had one in the past. It lasted a while but I my tank crashed after a I moved the tank. I lost it. I believe they are just filter feeders. Out during the day and in the sand at night. I know they like a deep sand bed 4" or deeper. It like my sand bed. With using the right food you might be able to keep one. Such as reefroids etc. I have heard they are very hard to keep and I don't know how I would have made out if my tank didn't crash. Here is a pick of it. 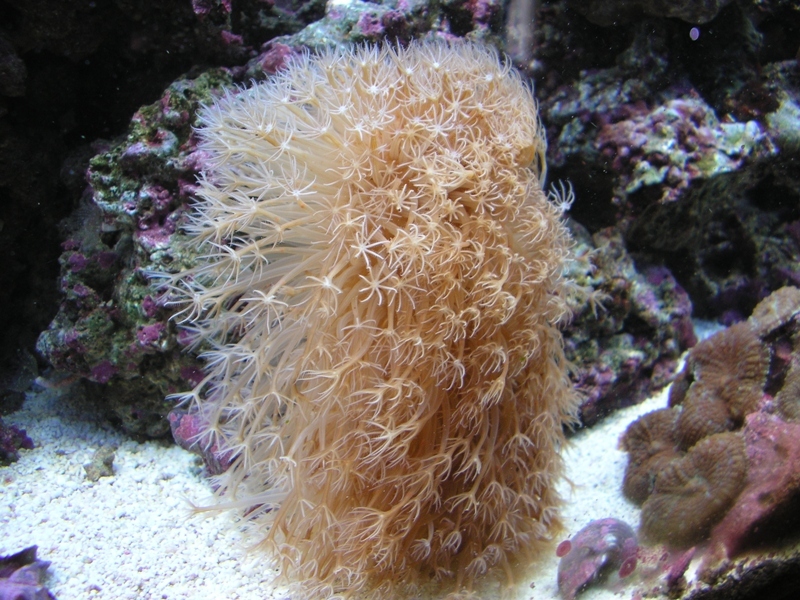 The sea pen, looks alot like a corky sea rod-gorg probably the same thing. I have had a corky sea rod for almost 4 months, and its doing great. They are filter feeders and they are also photosynthetic. Feeding reef-roids and cyclopeze seem to make it very happy. Its a decent grower and its very beautiful. I havent had much luck with other non-photo-syn gorgs, but this one is doing great.